With tons of CBD pet brands and countless different CBD products, it can be rather difficult to find a high-quality, cost-efficient product. If you are searching for the most affordable CBD for cats you should know how to compare the prices, quality, and quantity of CBD in each product. The search can be confusing due to the different volume sizes and potency ranges of CBD products. But, if you do the proper research and compare prices you can purchase a high-quality product for the most affordable price! Let’s break down the qualities of what makes an efficient CBD product and if it is worth the price when comparing it to other similar products. CBD (Cannabidiol) is one of over 80 different cannabinoids that comes from the cannabis plant. For millennia, the cannabis plant has been prized for its medicinal qualities and its uncanny ability to effectively treat a wide range of ailments in humans and animals. Today CBD is in extremely high demand. CBD gains massive popularity due to its expansive range of health benefits along with the fact that CBD is safe, natural, and efficient. It’s a good idea to pay attention to the growing and extraction phases of CBD products. The CBD can degrade and be of low quality due to poor growing, extraction and manufacturing practices. When searching for good CBD products at competitive prices, there is more to it than how much it cost. If you want a quality CBD product for your cat it’s a good idea is to pay attention to the source of the CBD. The most common and widely known cannabinoid is tetrahydrocannabinol (THC). This is the active ingredient in the cannabis plant and is widely known as marijuana. CBD and THC both have extensive medicinal qualities but only one is psychoactive. CBD is not psychoactive. That means it will not have any kind of intoxicating effects. This is particularly useful for treating your cat as most animals do not respond well to any kind of intoxication. They frequently become agitated and confused under these conditions. Over the past several decades, botanists and scientists have developed strains of the cannabis plant that isolate these various cannabinoids. For example, high-quality CBD products will be produced from hemp plants. Hemp plants legally must have less than 0.03% THC, meaning that products that are produced from them will have basically no THC (it will not get you or your pet “high”). Hemp plants that are grown in the United States and certified organic are the highest quality. They contain no poisons or pesticides. The CBD products that they make from them will be the most effective. After the hemp is grown to maturity they cut the crop then it goes to through extraction. Extraction is another process to keep in mind when searching for quality CBD for cats. This is an extraction process which uses CO2 to extract different cannabinoids from hemp. CO2 extraction is agreeably the cleanest method of CBD extraction. This is because the CO2 used is the same element (carbon dioxide) we exhale from our lungs. This method uses CO2 in a liquid state and any residual in the end product simply evaporates in room temperature. This extraction process is not popular among larger CBD companies. This CBD oil extraction is more of a practice which CBD enthusiast perform at home. Large manufacturers choose not to use oil extraction because it ends with low yields of CBD (the process is wasteful or inefficient). Oil extraction uses heat and oil (coconut, hemp, olive oil, etc.) to extract CBD and other cannabinoids and compounds (terpenes and flavonoids). The high heat levels can degrade the quality and amount of cannabinoids to be extracted. Too much heat destroys cannabinoids! Of these three methods, solvent extraction is the most common and the most cost-effective. A manufacturer will take organic, American hemp plants and separate the flowers, leaves, and stalks. These parts of the plant are then submerged in a solvent (usually isopropyl alcohol, butane or ethanol). The solvent leeches all of the high-quality CBD out and then it should evaporate, leaving behind only the raw CBD oil. The problem with this is that some believe there is potential for residual impurities to be left in the end product. These impurities can come from the solvent being poorly refined or manufactured. The impurities do not dissolve therefore they are left behind and become part of the end product. Amongst the common extraction methods, CO2 extraction is the purest, healthiest and most efficient way to get CBD. This is why HolistaPet chooses to use only CBD from CO2 extraction in their products! Not only are our products natural, pure and effective, but the prices beat the competition! 🤗 See for yourself. With so many products the search can be confusing due to the different volume sizes and potency ranges of CBD for cats. Not to mention where to find CBD for cats. There are internet vendors, veterinarians, pet stores, and delivery services for CBD, so how do you find the best deal? If you do the proper research and compare prices you can purchase a high-quality CBD product for the most affordable price! When doing comparison CBD shopping, of course, one of the major factors is the actual price of the product. This is true, but there are other variables that play a roll in the calculation for the amount of CBD your buying per penny. To compare two or more products for the price per milligram of CBD in each product, you have to perform a bit of math. Simply take the price of the product and divide amount by how many milligrams are in the product to get the price per milligram (mg) of that particular item. Do this with two or more products and you can compare the cost of cents per mg of CBD in each product no matter the volume or potency in each product. To get the price per milligram of CBD in the 150mg tincture, you would take the price of $25.95 and divide it by the number of milligrams of CBD in the product like so: ( $25.95 ÷ 150mg = $0.173 per milligram of CBD). The answer is $0.173 per mg. This rounds down to $0.17 per mg of CBD in the 150mg tincture. Now perform this simple equation again for the 600mg HolistaPet tincture and you will get $0.09825 cents per mg of CBD. Round this up to get $0.10 per milligram of CBD in the 600mg tincture. Now simply compare the price per milligram of CBD of each product to see the difference in pricing. The 600 is a better value but you must spend a little more to save more. Buying a larger size or higher concentration of a product is not the only way to save. For example, some companies will offer variety bundles of CBD products for sale. They may include a bottle of tincture and CBD cat treats for a deal as a way for you to get the most for your cat and save in the process. With a CBD for cats variety bundle, you can give your cat the power of pure CBD oil and give them CBD cat treats intermittently. The CBD cat treats offer additional beneficial nutrients like salmon oil. Some companies like Holistapet also offer bundle deals if you buy more than one of the same item. Another saving option some retailers offer is subscription membership rewards for becoming a loyal customer. At Holistapet we offer a subscription membership to receive additional savings on all products! Find a product you like and subscribe to a free plan to receive savings and your CBD on time when you need it. If you shop right you can save on CBD for cats, but always make sure you are buying from a trustworthy company! Is It From A Trustworthy Company? The CBD industry is exploding. However, not all CBD products are created equal. There are companies out there that will provide ultra-effective products at reasonable prices. Be wary though as for some CBD distributors charge high prices for low-grade CBD. Since the CBD industry is still gaining its legs the and in turn is not FDA regulated, some shady distributors try to sell products with less or no CBD in comparison to what their packaging reads. You want to see if they have a COA (certificate of analysis) or lab test results for their products. This should have information on how much CBD is in their products. Another telltale sign of a legitimate company is their return policy. A trustworthy company should offer 100% money back on returns with no questions asked. This is the policy always guaranteed when going with Holistapet. What extraction process did they use? Once you found your product its time to figure out the correct dosage. 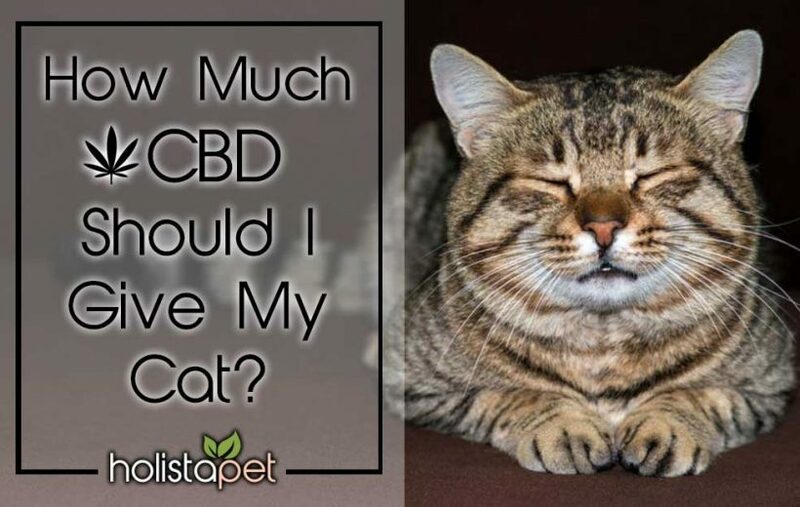 This is important because if you give too little you will not be giving your cat the amount of CBD it needs. Adversely if you give your kitty too much CBD (more than it needs) you will be wasting CBD and money. What is the Proper Dosage for Cats? CBD is an immensely safe and non-toxic supplement that you can administer to your cat immediately. In order to get the best results, however, it is recommended that you notify your veterinarian. Using products that come from a highly-regarded company will ensure that your supplements have clearly-marked and controlled dosage amounts. This will allow you to control how much you give your cat on a daily basis. 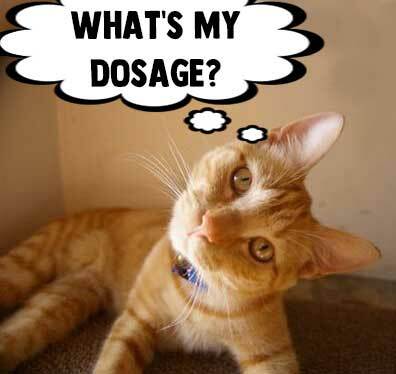 Determining a regular or strong dose will depend on your cat’s size. It is necessary to weigh your cat to determine the proper dose. Once you have done so, you can use this handy guide to measure the dosage. For a regular dose, give one-quarter (0.25) milligrams for every 1-pound of body weight. If your cat weighs twenty 20-pounds, then a regular dose would be 5-milligrams. For a strong dose, give one-half (0.5) milligrams for every 1-pound of body weight. If your cat weighs twenty 20-pounds, then a strong dose would be 10-milligrams. Pay attention to how your cat reacts to the treatment; you can always increase or decrease the dosage depending on the severity of your cat’s condition and their reaction to the treatment. CBD is so safe that it is impossible to overdose on, so if you give your cat a dose that is “too high”, they will simply get tired and sleep it off. CBD is most effective if given daily. It should be treated as a regular addition to your cat’s health and wellness regimen. The regular dosage schedule is to give one regular or strong dose in the morning and one at night. For chronic pain, CBD for cats is most effective if given every eight (8) hours. If you are using it to treat anxiety or agitation, then administer the dose thirty (30) minutes before the triggering event (such as fireworks, separation, thunderstorm, or travel in the car). You can choose to give your cat either treats or a tincture. The treats are best for long-term treatment as the levels of CBD in the bloodstream will stay elevated for a longer period of time. The treats are also useful in training your pet in various capacities. However, if your cat is suffering from severe vomiting, then they will likely not be able to stomach the treats. If this is the case, then you can administer a tincture. You simply take the dropper out of the bottle and drop the CBD oil under your cat’s tongue (sublingually). 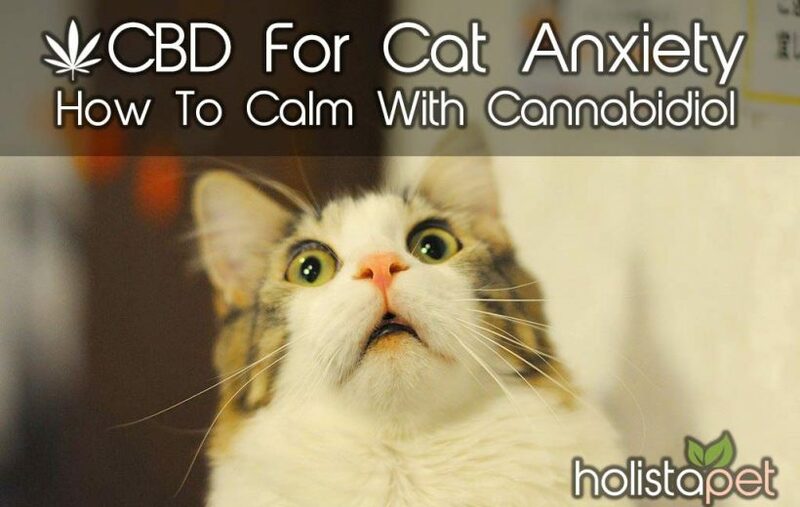 This will bypass having to feed CBD to your cat and will result in a high level of CBD in their bloodstream in a very short period of time (usually about 5 minutes). However, this CBD will metabolize quicker than the treats. Purchasing a bundle of a tincture plus treats ensures that you will have both CBD products and can use them interchangeably, depending on the needs of your cat on that particular day. previous post: Is CBD Oil Safe For Dogs?